3B Beauty is currently the only beauty subscription, I'm enrolled in. I got my first box last August and this is box I received for March 2016. 3B which stands for Beauty Beyond Borders is a beauty subscription box that makes Asian beauty products more accessible overseas. This is a monthly service that costs $12. Each box contains 4 -5 deluxe samples from a range of brands and the products are supposed to be "new or popular in Asia but hard to get your hands on". I would say that 3B is like an Asian beauty version of Birchbox or Ipsy. And even though it's delivered in a postal box, the products are actually contained within a mesh pouch. 3B is currently just a US based subscription service. This box is ideal for anyone interested in trying out Asian beauty products or can't access them easily. They have a waiting list for new subscribers which you can sign up for here. This mascara claims to transform lashes and make them thicker, longer and more voluminous. 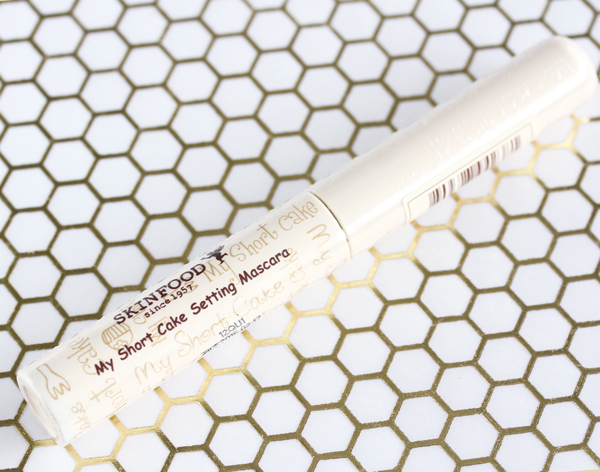 It has a quick drying formula that is supposed to be smudge-proof and long lasting. Hey it's a mascara! I'm neither excited nor enthused by this. I mean mascara is a product I always use so I'm sure I'll get to this one eventually. I'm currently using a Korean mascara from Peripera which I happen to really like. If this one works anywhere as well, I'd be happy. 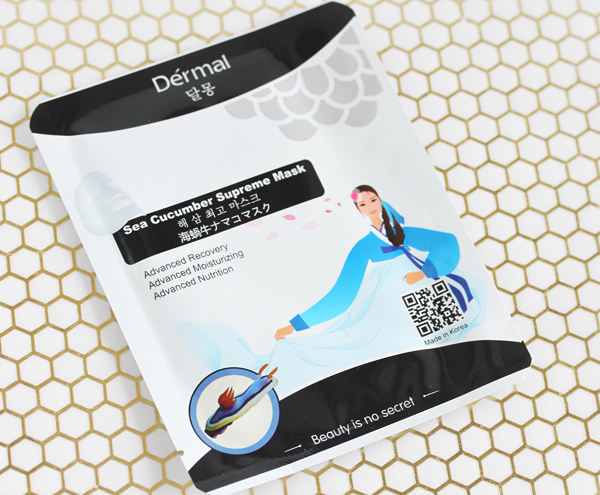 This is a Korean sheet mask with sea cucumber extract, collagen, arginine, alanine and other ingredients to provide anti-aging, anti-stress and brightening effects. It also contains a refined sea snail extract to nourish, moisturize and heal. I'm a frequent sheet mask user and I enjoy trying new ones with different ingredients. I have eaten sea cucumber before but I've never put it on my face. Products with snail extract have worked well for me. This should be interesting to use. 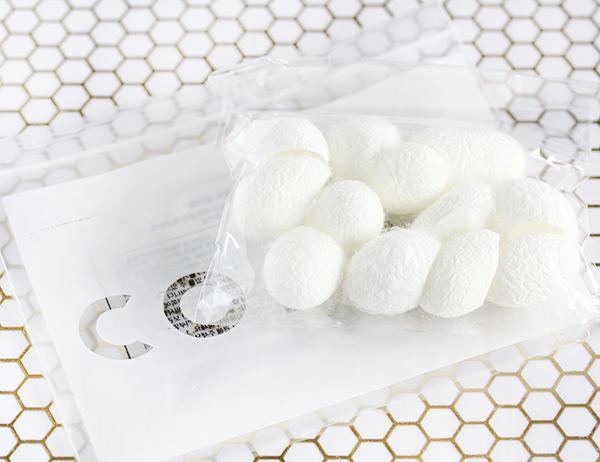 These 100% silk finger pods are gentle exfoliators that remove sebum and blackheads from your pores with minimal irritation. To use, soak the pods in warm water for 2 to 3 minutes, to soften. Then put on your fingertips and massage your problem areas. Cleanse and pat dry. For best results, use 1 - 2 times a week. These are appropriate for all skin types even sensitive. These are a little unusual and I have tried them before. They do work to some degree but I also think they have some degree of novelty to them. Not a product that I'd re-buy and it was kind meh to see them here. 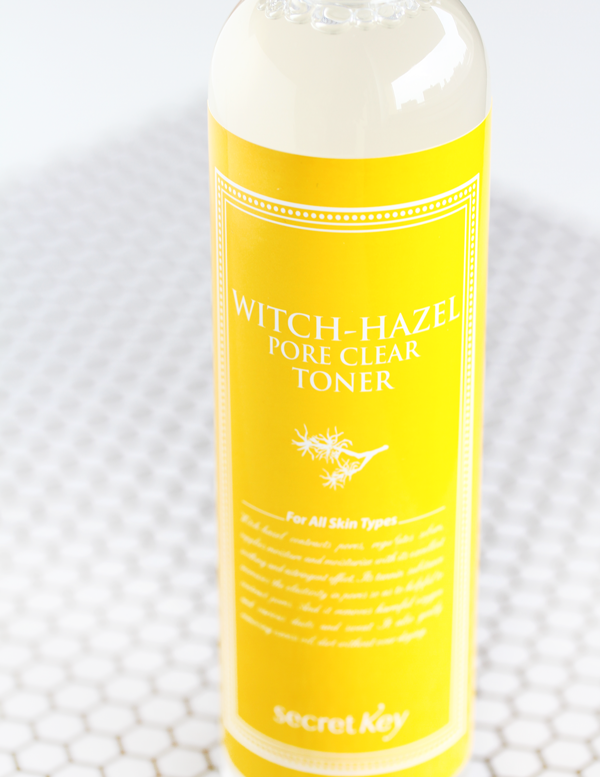 This toner has pore tightening, oil control and deep cleansing functions so it's best for oily or combination skin. It contains witch hazel, aloe vera and snail extract and is free of parabens, mineral oils and phenoxyethanol. Secret Key is a Korean brand that I'm familiar with. 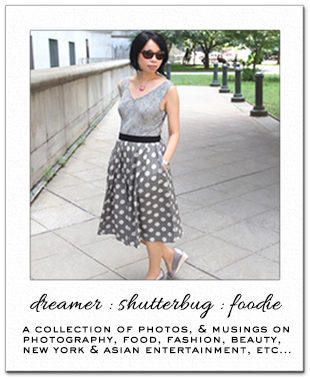 They're known for good and inexpensive beauty products and i do like some of them. Since my skin is dry, my husband will likely be using this toner instead of me. I saw some really good reviews for it on Memebox so we'll see. The Verdict: I didn't do a post on last month's box but it was a real disappointment. This one was definitely an improvement. I generally prefer skincare to makeup so getting 3 out 4 skincare products was good. And the fact that all 4 products are full size items is nice. Again it's kind of hard to get excited about things that have been around like the CosRX Blackhead Silk Finger Balls. I feel like 3B just isn't quite delivering in terms of products that are new or hard to obtain and this is something I keep telling them when I fill out their surveys. Still it's a decent value for $12. Have you heard of any of these products? Which one would you be interested in trying? I like the name of that mascara :-) My skin reacts badly to witch hazel though, so that toner is a no no for me. Such an interesting beauty box! Like the finger balls and the witch hazel interesting product first time I heard of both. I think I would enjoy the witch hazel toner, but I feel like these subscriptions are a bit tricky, as you don't really get things catered to your skin type and end up with nice products that won't work for you. I'm not really up-to-date when it comes to Asian skin care so I'll admit these brands are new to me. I can see though why this would be a bit of a disappointment for you, esp. if you've already tried some of these lines. I will say though that it's too bad there's not as much subscription boxes here in Canada! The box is not bad considering you only paid $12 for it but yes, subscription boxes can be very tricky. Sometimes they are great but more often than not, they are a miss. This sounds like an interesting group of products for this box. I grew up using witch hazel and like it as toner, but I typically use a rosewater and cucumber toner now. The mask would probably be my favourite. Thanks for sharing. Looks like you got some nice products this time, Rowena. Those finger balls looks like a funny kind of thing, not sure if I would like to try them, tho. Wishing you a beautiful day, girl. I have never seen or heard of finger balls but I would love to try them! Thanks for sharing an honest review of this beauty box brand. If this box was an improvement from before, maybe the next one will be even better. I haven't heard of any of these products, neither I am subscribed to any beauty box, but I know Ipsy since my sister is subscribed and sends me products. Anyway, the mascara name is so funny! I am really interested to try sea cucumber, never eaten before. The fingers pods sound interesting, I've never seen such. This one is definitely a monthly box I'd like to receive! Glad you are happy with this month's box, Rowena! This service is a great way try products not readily available in The States. I wish more of these box services you could purchase on demand. You can do that now with Birch Box buy I think only in person. i love these!! some cool products--even the novelty ones lookfun to try. You got some lovely items doll! Haha, I scrolled right down to the finger balls to see what they were first, they look so interesting I would love to try them! Never hear of them before. Want to try that sea cucumber supreme mask. I'm intrigued by the sea cucumber mask! this box sounds great...good to know that it is an improvement from the last one.